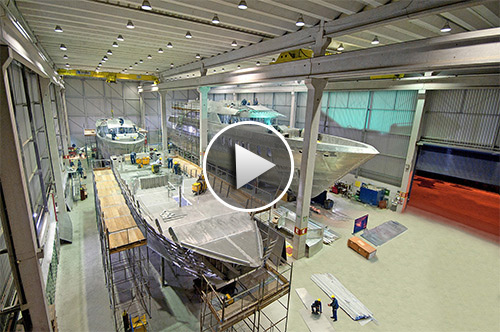 MCP Yachts has 38 years of strong tradition in naval architecture and construction. Market leader in South America, it has been responsible for building the largest aluminum yachts in the region. The shipyard has its roots in construction of luxury yachts; commencing with 90ft steel hull vessels at the beginning of the 80’s. In 1994, MCP built a 120ft aluminum hull presented at the Nice Boat Show and started to gain its international reputation for excellence in boat building. Nowadays, MCP employs world leading techniques in design and shipbuilding, delivering top quality high performance vessels, based upon the superior structural resistance and lightness of their aluminum construction. The company has created over 250 customized designs for pleasure and service boats and is rightly proud of their many finely finished vessels, which today sail the seven seas with their brazilian or foreign owners.